“The Black Sea will be in the zone of our special control. 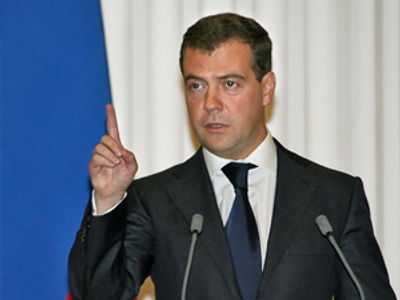 We do not need instructions on how to behave,” Medvedev said in Vladikavkaz on Monday. As far as the situation around the Black Sea is concerned, it will “strictly comply with the international agreements and the decrees signed by myself as the supreme commander-in-chief,” he said. “Unqualified interference will not result in anything good,” he said. On August 13 the Ukrainian President Viktor Yushchenko expressed his intention of implementing two recommendations made by the National Security and Defence Council regarding the movement of the Russian Black Sea Fleet outside its base in the Crimea. According to the decisions, warships or planes may only cross Ukraine's state border after at least a 72-hour prior notice to the Ukrainian General Staff. Such a notice should also contain information about arms, ammunition and explosives and military equipment. Yushchenko had earlier described the use of Russian Black Sea Fleet ships in military operations in the Black Sea area as a dangerous precedent. On August 10 Ukraine warned Russia against the possible participation of the Black Sea Fleet in the conflict in South Ossetia. The Russian Foreign Ministry in response expressed surprise over the tone and content of the statement. It said in its comments that the measures which Ukraine had threatened to take would not be consistent with Russian-Ukrainian agreements and would be unfriendly towards Russia. Meanwhile, acting chairman of the Ukrainian National Security and Defence Council Valentin Nalivaichenko has called for the creation of an international commission for assessing the Black Sea Fleet's actions in Georgia and help work out a mechanism of control over its operations. He also called for hiring international experts to work in the sub-commission on the Black Sea Fleet within the international Ukraine-Russia commission. He believes it's necessary to investigate all cases when the Black Sea Fleet puts to sea to find out if this is consistent with Ukrainian legislation and international agreements. Meanwhile, Anatoly Nogovitsyn of Russian General Staff says the United States, Canada and Poland are planning to introduce their warships into the Black Sea by the end of August. “As far as we know, U.S., Canadian and Polish naval forces are planning to introduce their warships into the Black Sea by the end of August,” Nogovitsyn told a news conference on Tuesday.